Strangely the original name of the delightful 18th century building that is now the Richmond Arms was Waterbeach. Apparently it reflects that the coastline, currently some 5 miles away, was once very much closer to its doorstep. It is now more appropriately renamed after the Duke of Richmond who purchased his hunting lodge here in 1697 and the Arms are part of his mightily impressive Goodwood Estate. The Dukes ancestors still manage the rich and fertile farmland of this Estate, managed by Goodwood Home Farm, one of the largest lowland organic farms in the UK. Ultimately it is this tradition and care lavished upon this patch of land that makes dining at the historic Coach House a very special experience. Each meal that we enjoyed at the Arms was exceptional – varied, imaginative and rich in flavour. In large part this is due to the quality of the ingredients, whilst foraging for wild produce from the bountiful Estate is a further inspiration. Lying at the heart of the 12,000 acre estate – which also incidentally includes the House, Racetrack, Motor Circuit, Aerodrome (and so much more) – it is the farm’s location at the foot of the Sussex Downs that provides a free-draining chalky soil ideal for, amongst other produce, the spring malting barley. This is used to brew Goodwood’s own ale and lager and is also perfect pasture for their sheep and cattle – carefully selected native breeds that are fed organic home grown cereals. Diligent husbandry of everything from the soil, crop rotation and animal management brings a unique production of award-winning organic meats, milk and cheese with a real quality and depth of flavour – a genuine link from field to fork. If the low food miles and a very careful control of waste also made us feel good about the dining experience at the Arms it is the skills of Matthieu Vidal and his ‘brigade’ of chefs that undoubtedly added the final touch. We enjoyed perfectly cooked and immaculately presented dishes like a starters of flamed mackerel and browned shrimps served with celeriac and apple and heritage tomatoes with feta and jerusalem artichokes. Meatier options included a fine beef consommé and oregano rubbed pig jowl served with celery, apple and walnut slaw. The connection to Home Farm of course provides the source for meat-oriented dishes like the impressive sharing later of Rack of Lamb and Cushion Steak, Ox Tongue and Brisket but there is no need for those who prefer fish to miss out with choices like Pan fried Pollock filets with samphire and creamed celeriac. Desserts too were equally inspired – a milk and Almond Bar for example was rich, creamy and indulgent served with chocolate sauce and salted almonds, as was Raspberry Delice with poached nectarines and honeycomb. The cheese board of course was a must-try, featuring a selection of hand made estate cheeses. There were a flavoursome Charlton – a creamy, firm textured farmhouse cheese with long, rich flavours and a tangy finish, Levin Down – a rich and creamy soft white cheese which melted in the mouth plus the award-winning soft blue veined cheese, Molecomb Blue. Naturally we also tried one of the local estate-brewed beers – a Goodwood Sussex Ale – delightfully rich and hoppy, along with a local Sussex Nytimber Classic Cuvee sparkling wine, as good as any French competitor! Whilst the Richmond Arms is the pinnacle of the dining experience the bar offers a tasteful contrast, with its rich leather sofas, original open fireplace and elegant furniture. An excellent spot for a local beer, one of Barman Ivan’s cocktails along with something from the morning breakfast or afternoon bites menus. Another afternoon alternative is an afternoon tea which can be taken either in the bar or on the terrace. A clever option here is the Gentleman’s Afternoon Tea – a rather more meaty and savoury take on the usual cakes and finger sandwiches (which are of course also available) featuring for example home made sausage rolls, beef rib and chicken terrine washed down with a local ale! 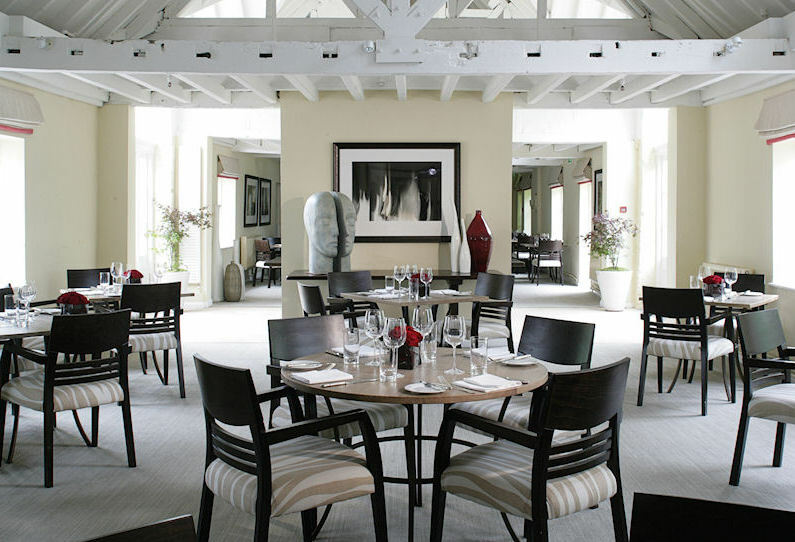 If a visit simply to enjoy the restaurant is a special experience we would highly recommend enjoying it in conjunction with a stay at the Goodwood Hotel (see review here) and perhaps one of the estates many events like the Goodwood Revival or Festival of Speed. CELLOPHANELAND* were guests of the Richmond Arms.